Jordan Cooke (second from left) and Laura Dally (second from right) were among those honoured at the annual Huskie Salute awards dinner. 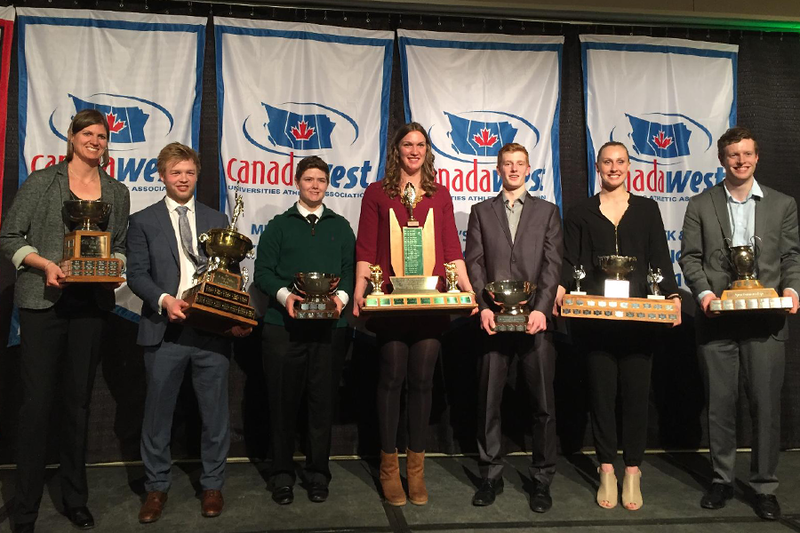 The Canada West Outstanding Athletes of the Year in their respective sports, Laura Dally and Jordon Cooke have been named University of Saskatchewan Huskie Athletics' female and male athletes of the year. Dally is the second women's basketball player in the last three years to win the award after Dalyce Emmerson was the winner in 2014. Cooke is also the second men's hockey player to be named the Huskies top male athlete in the past three seasons. Derek Hulak was the last winner from the team in 2014. Canada West women's basketball MVP Laura Dally helped lead the Huskie women's basketball team to their first ever CIS Championship. The Kinesiology student from Bright's Grove, Ont. averaged 17.2 points per game and was named a tournament all-star at the CIS Final 8 in addition to her appointment as a CIS First Team All-Canadian. The nation's top goaltender, Jordon Cooke, also received the award for the conference's most outstanding player after helping the Huskies win a Canada West Championship. The second-year Arts & Science student from Leduc, AB was leaned upon all season and was pivotal in the Huskies University Cup run. At the CIS Championship he was named the tournament's top goaltender after being honoured earlier in the weekend as the CIS Goaltender of the Year and a First Team All-Canadian. Huskie Athletics handed out five other major awards at the annual Huskie Salute Friday night at TCU Place. The event also featured the achievements of the athletes of the University of Saskatchewan's 15 CIS teams. Canada West and CIS All-Stars/All-Canadians and award winners, along with fifth-year athletes were also honoured at the celebration.